← Day 0: Earthquake! 地震! Hey all–we’re still doing fine here in Japan. It’s been a pretty crazy day/night, and we’re a little bit exhausted. The aftershocks seem to have calmed down Literally, as I finished typing this the alarm on the TV went off. “It’s an alarm for the earthquake that’s happening…NOW.” I said, as the couch, windows, and doors started rattling AGAIN. This constant rattling is really unsettling, and surprisingly exhausting. We’re keeping a close eye on Fukushima, and hoping the wind continues to blow seaward. The shelves are pretty bare at the grocery store, and there’s a general uneasy feeling in the air. It’s strange times here in Japan. Thank you all so much for your kind words, comments (here & on Facebook) and tweets. We’ll definitely try to keep you all informed & updated if anything happens. A number of people have asked how they can help–for right now, just be very careful about donations. We definitely recommend only donating to trusted entities like the Red Cross for now, and we’ll let you know if anything else comes up! 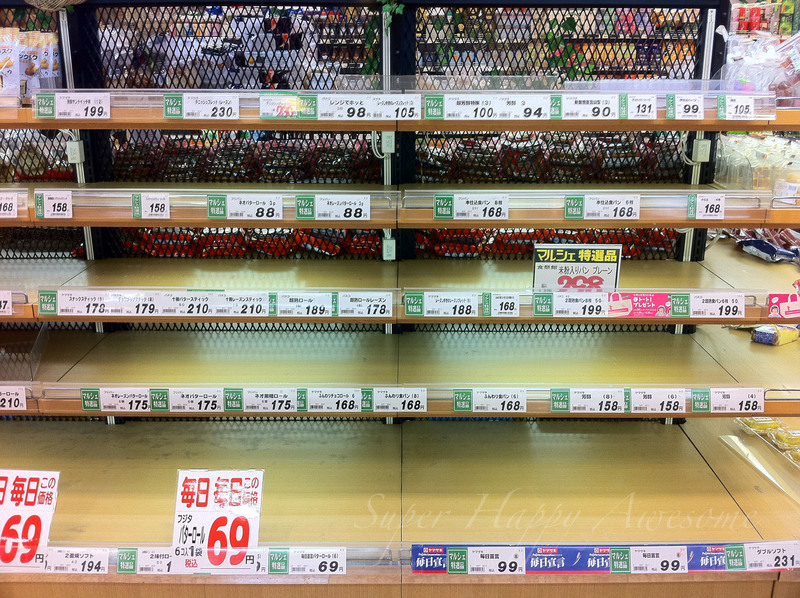 This entry was posted in Uncategorized and tagged Earthquake, grocery store, photo, shops. Bookmark the permalink. Glad you’re doing ok. I realised I don’t know exactly where you’re living – but it sounds like it’s close enough to be scary. Take care, and I hope things stop shaking soon. I am so glad you guys are okay. Keep staying safe, and we here stateside will keep sending good juju your way! I was wondering if your school or schoolkids/faculty were affected by this terrible disaster and if there is some sort of help money fund to to eventually direct our money to.